Little readers are introduced to the act of Christian prayer. 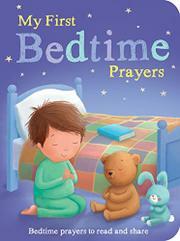 Developing a child’s faith is a tricky business, and this board book is here to help. The handsomely bound board book contains over 15 traditional Christian prayers for caregivers to read with their children. Some are on the long side, but all are appropriate for little ones beginning to have conversations with God. (The version of the Lord’s Prayer included is the Protestant one, ending with the doxology.) The prayers are illustrated with simple scenes of everyday life being lived by children of many races who seem to share similarly comfortable socio-economic suburban circumstances. The book provides a solid resource for caregivers looking to teach their children about prayer, but there is nothing here beyond the prayers themselves. The meanings behind the words and the tradition inherent in them are up to caregivers to sort out and impress upon their children. MY FIRST LISTEN, PLAY, AND SAY! MY FIRST TOUCH, FEEL, AND PLAY!